After missing James Bond’s 22nd adventure in the theatre, the advantage I had over other people is I could watch Casino Royale and Quantum Of Solace back to back, seeing how Quantum is a direct sequel. "Yes!" I thought. This is the way maybe QOS was meant to be seen. 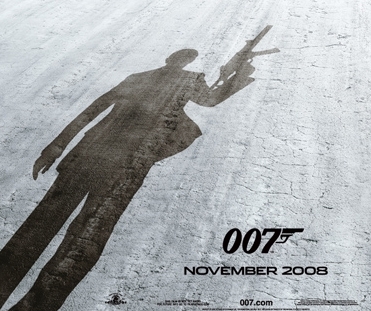 The second movie will make more sense and be so much more enjoyable with Casino Royale fresher in my mind. So that's exactly what I did. Boy, was I wrong! By watching the two movies back to back, it just ended up making Casino Royale look like Goldfinger and Quantum Of Solace the pointless, mismanaged, confusing mess that it is. We were set up with Bond capturing Mr White at the end of Casino Royale. What comes next? Oh well. Maybe we shouldn’t have wondered. As Quantum of Solace opens, we get a extremely fast car chase in Italy as Bond tries to escape with his valuable hostage Mr White (Jesper Christiansen) locked in the boot. This car chase is so quickly edited and hastily filmed that we're not even sure who's chasing who. Even the Italian policeman seems confused, describing on the radio "A grey Aston Martin being chased by a black Alfa Romero." After watching this flick four times, Bond’s car looks black to me. Maybe the cop is confused and thinking of the Aston Martin 007 won over a game of cards in the last film. Maybe he just can’t keep up with the speed and the bizarre editing of this movie. In fact, this entire film, whether it be the action, dialogue, character development, or direction, is all very hasty and rushed and very poorly constructed. 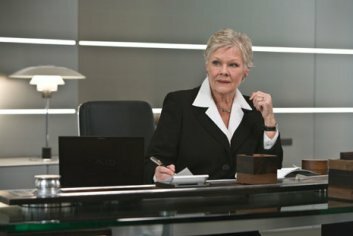 As Bond delivers Mr White to M (Dame Judi Dench) at MI6, the interrogation ends very abruptly. "We have people everywhere," says White. All of a sudden we hear gun fire and it's all over. It turns out White wasn't kidding as it was M's personal bodyguard, Mitchell, who also works for 'Quantum', who started the shooting, almost killing Bond and his boss. Bond ends up chasing this double agent down and poor Mitchell meets an untimely demise. Again, the action is all done far too quickly, rendering the film confusing at times. Just wondering, since when do operatives at MI6 refer to M as "Mum"??? It must be those home baked chocolate chip cookies she brings into the office for her operatives! Following a forensic investigation, Bond’s off to Haiti to track down a contact of the double crossing MI6 agent Mitchell. Here he meets someone who can either make or break a Bond film - the main villain, Dominic Greene (Mathieu Almaric). Greene is in charge of an organization called Greene Planet, a supposed humanitarian and philanthropist who is trying to build ecological preserves. He’s actually a member of Quantum, making deals with not so nice Generals to buy up land to monopolize oil, and also take control of all water supplies. Wow! Pretty scary stuff! He could’ve been even more diabolical perhaps by loading plastic bottles and cans into landfills without telling anyone. While James Bond villains are supposed to be evil, malicious, insane, and dangerous, what we get with Dominic Greene is someone who is an uninteresting, pathetic, slimy, weasel. I laughed out loud when he screams at his ex-girlfriend (and soon to be Bond ally) "Don’t talk to me like I’m stupid!!!! It’s unattractive." Who writes this stuff? Greene is not even worthy to hold the white hankerchief that wiped the blood from Le Chiffre’s tear duct. When Mr White warned "We have people everywhere" he should’ve mentioned how uninteresting and dull they all were. The rest of the movie plays out with Bond meeting up with the beautiful Camille Montes (Olga Kurylenko), a former lover of Greene’s who has a personal vendetta against the General that Dominic Greene is making his insidious deal with. It’s all work and no play for this 007 and his girl as they both have scores to settle. It seems the slimy General terrorized Camille’s family when she was just a young girl. Following Greene to Egypt, Bond infiltrates a Quantum meeting at the opera. This is one of the few sequences I enjoyed because of its suspense and it’s also a little reminiscent of the pyramid scene in The Spy Who Loved Me. A gunfight ensues and a bodyguard to an advisor of the British PM is killed. M, with the utmost confidence in her best agent (yeah, right) blames Bond for this, and has all his passports, credit cards, dry cleaning claim tags, McDonald’s two-for-one coupons etc revoked. A beautiful Agent named Strawberry Fields (Lennon and McCartney anyone?) is dispatched to bring the renegade 007 back to London. Bond does what we would expect of our supposed to be dashing agent and seduces her in his hotel room. She meets an unfortunate demise later at the hands of Quantum, when Bond finds her laying dead on his bed, covered in oil. A nod to Shirley Eaton’s Jill Masterson being left dead on Connery’s bed covered in gold paint, according to the director. This little tribute to Goldfinger doesn’t really work and Marc Forster should’ve known better. We also get treated to the reappearance of two solid characters from Casino Royale. Rene Matthis (Giancarlo Giannini) and Felix Leiter (Jeffrey Wright) Unfortunately, both are pretty much wasted as they’re given very little to do and their screen time is minimal. Daniel Craig himself will never be an entirely comfortable casting choice for me to be James Bond, based on how I envision 007 in Fleming's novels and because of the handsome 'Bond look' the five actors who've preceeded him have created. Having said that, I think he's a decent actor and the only criticism I can direct his way here is that he agreed to do this film! In the end, James Bond gets the job done, dispenses with Dominic Greene, finds who made Vesper betray him, earns back M’s trust (will she ever get off his back?) and Camille finds her Solace, also. I’ve seen this movie four times now and it makes as little sense as the viewing before. This movie plays like an incredibly long preview with amateurish gaps in character and story development, suspense, and plot. Quantum Of Solace is easily my least favorite in the James Bond series and one of the poorest films I’ve seen in a long time. All in all though I shouldn’t complain as my DVD was a gift. James Bond will return again one day.